Sydney-born Yvonne Audette formed part of a generation of artists (including John Olsen, Robert Klippel, William Rose and Peter Upward) who came to prominence from the mid 1950s with a diverse range of abstract modes aligned to both contemporary European and New York School tendencies. Their work represents the first significant movement of abstract art in this country. After initially studying under teachers including John Passmore and Godfrey Miller and developing from their tutelage a ‘Cezannesque’ figurative style, Audette left Australia in 1952 to seek further instruction in America and Europe. She first settled in New York where she found herself at the heart of the avant-garde movements of abstract expressionism. The experiences of studying in the city introduced her to a new conception of art. 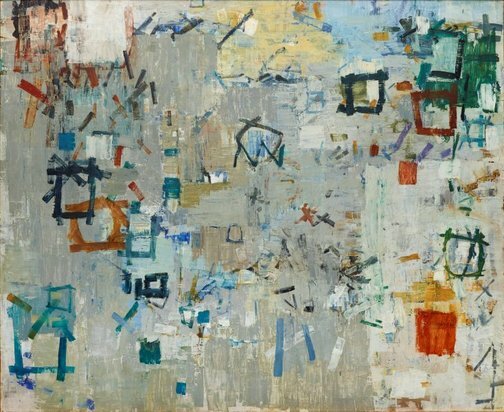 It was not until Audette left America for Europe in 1955 that she embarked on her first significant series of abstract paintings. Working in Florence in the late 1950s, Audette developed a distinct form of abstraction; one that toned the heady expressionism of the New York School, while maintaining a sense of its gestural energy. She more readily identified with forms of Tachisme, and Art informel; the more subtle movements of European expressionism that would remain as an enduring influence on her work. Italia benvenuto is a significant moment in Audette’s early series of abstractions, and indicative of the style which she had finessed by the late 1950s. In the work the artist resolves a sense of equilibrium between lightness and density, fracture and integration as calligraphic forms and textured planes of colours appear to effortlessly interplay. Audette’s engagement with the Japanese calligraphic arts at this time, and their associated notion of investigating essential forms, is here inscribed in her mark making. Italia benvenuto is indicative of Audette’s slow and deliberate approach to her art production. She ‘slowed down’ the seeming brash execution of the works of the New York School, and the often random features of Tachisme. By contrast, Audette spent months developing and reworking her paintings before considering them complete through the belief that “each stroke is significant in relation to the structure. If the structure didn’t work then it had to be reworked". Italia benvenuto (‘Welcome Italy’) is telling of the significance of the artist’s move to Italy, where her distinct form of abstract painting initially flourished. For Audette, Italy represented a place of both great artistic tradition and a vibrant contemporary culture that she felt propelled her own investigations into abstraction. Working between Florence and Milan and travelling throughout Europe and the United States, Audette remained Italy until she returned to Australia permanently in 1966. Signed and dated l.r. corner, black oil? "Audette 1957". Signed and dated l.l. verso, black fibre-tipped pen "Y. Audette 1957". Dated l.l. verso, black fibre-tipped pen "1957". Denise Mimmocchi, Look , 'Antiquity and abstraction', pg. 14-15, Sydney, Aug 2016, 14, 15 (colour illus. ).